Alter The Press! 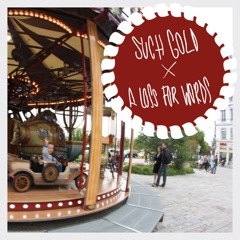 : Album Review: Such Gold / A Loss For Words "Split" 7"
Album Review: Such Gold / A Loss For Words "Split" 7"
Despite the contrast in each of their sounds, Such Gold's second split EP of this year is with pop punk's underdogs A Loss for Words. Both bands have had an eventful year, with Such Gold's numerous EP releases and constant touring as well as A Loss for Words' second full-length album, 'No Sanctuary'. Tearing through with 'Scoreboard' which ploughs it way through with pounding riffs and pure adrenaline. Such Gold unleash a relentless song backed with a pop aesthetic that just builds and builds. 'Backyard' on the other hand starts out with an intricate introduction until it is interrupted by Ben Kotin's raw vocals screaming "Oh what a sight to be seen, I left my wings back up in a dream", constant tempo changes in the song provide a constant pumping to the heart of the song. "American Needs A New Sweetheart" comes out as the complete polar opposite to the two prior tracks. A Loss for Words take the pop values of the spectrum of bands in the top 40 right up to pop-punk bands such as Valencia and counteract it with crunchy guitars and a heavy rhythm section. Another contrast comes from "Thomas Vs. Luongo" which, in parts, features a similar constant tempo change that Such Gold values. The blending of Such Gold and A Loss for Words may not be as strange as it originally seemed and this split EP is perfect for fans who are holding out for new material from both bands.